Some folks have suggested that to increase my comic's popularity I should talk more about my gaming side. So I thought maybe I could set up some sort of a comic schedule and organize it all. Monday: A comic about how fun it is to shoot people on the interweb. 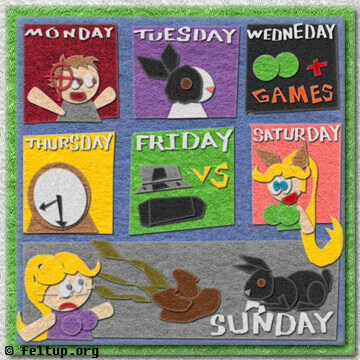 Sunday: Multi-paneled strip where I will talk about my life the previous week and how it relates to feces, whether I've gotten a job or a haircut, and if there's time.. more bunnies.